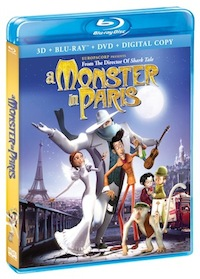 A Monster in Paris on DVD! 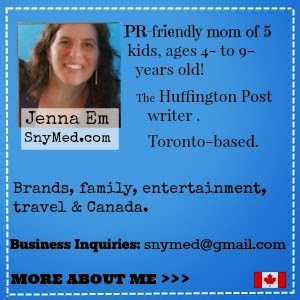 Featuring the Voice of Sean Lennon! Have you seen the CGI- and 3D-animated A Monster in Paris? It came to dvd and bluray combo pack this April, and features the voice talent of Vanessa Paradis and Adam Goldberg. It also features a big surprise: singer Sean Lennon (the son of John Lennon and Yoko Ono) as the English singing voice of Francoeur. A Monster in Paris is a charming movie about a flea that is accidentally grown into larger-than-human size (the "monster"). But the movie isn't only about the monster, called Francoeur (Sean Lennon), it is also about the unrequited love of shy film projectionist Emile (Jay Harrington), and his love interest Maud (Madeline Zima). There is also love in the Parisian air for Emile's friend Raoul (Adam Goldberg) and Lucille (Vanessa Paradis). All this is set in 1910 Paris, during the flooding of the River Seine. Lucille is looking for a new singer at her cabaret, (and without spoiling all the fun), the monster Francoeur has an enchanting voice and fits the bill. Needless to say, lots of commotion ensues! The music in A Monster in Paris is beautiful, haunting and nostalgic. My family did enjoy listening to it very much. As an adult, I did like A Monster in Paris, but unfortunately it did not hold my children's attention. I think that although the movie's dialogue was fun and witty, it just was beyond the age of my kids. Or perhaps there was too little action in some scenes to keep them engaged. As a result, I would recommend this movie for kids aged 8-years and older. Buy A Monster in Paris in stores everywhere! Have you ever seen A Monster in Paris? Have you ever visited Paris, or would you like to go one day? Thanks for sharing, I have not heard of this movie before. Sounds like my kids might be a little young for it still. Oh, that looks awesome. I haven't heard of this one before! I think Little One might be at the age where she'd enjoy it. I'd never heard of this one, but it looks like it would be right up my daughter's alley. Thanks for the heads up! I've never heard of this movie before and yes, going to Paris is on my bucket list!!! I have not seen or heard of this movie, but love to see it.